SpokenData offers a whole bunch of features related to transcription. 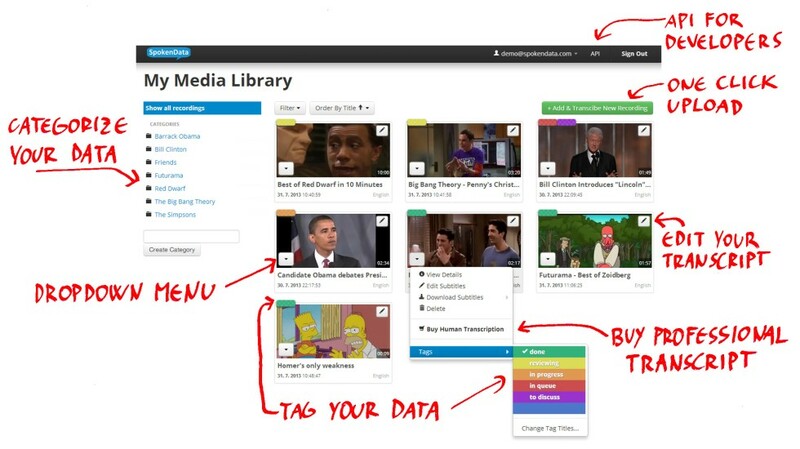 As a registered user you get a personalized media library with tagging and categories. You can add new media files by using an upload form or by passing a link. Each new media file is processed depending on your settings. You can select from automatic speech recognition in several languages to detecting of speech segments. When processing is completed, you are sent an email. Then you can easily modify the generated transcription in our online subtitles editor. If you desire for a highly accurate transcription, you can buy it for a reasonable price. We want to offer maximum of SpokenData to anyone. Since many of our features require authentication, you will need to register. However, you can try our online subtitles editor without registering at CaptionsMaker.com. All you need to do is to enter a YouTube video link. Then you will immediately start captionating the video from scratch. We accept a whole variety of multimedia formats. You can upload almost any audio or video file. If your file is located on a server, just enter its link. We also support YouTube videos. Currently, we automatically transcribe speech in English or Czech. Other languages will be supported soon. If you need automatic transcription of special content (medical, technical, ...), we can create a context dependent language model to suit your needs. Please note that automatic speech recognition is time consuming and may take up to several hours. The overall time is mostly dependent on the file duration and the number of processes in the queue. When the processing is finished, we send you an email. You can download the transcription in several formats such as SRT, TXT or XML. SpokenData has API. When you get signed in, you can see all API calls with live examples. We welcome any ideas that will help make SpokenData more useful. We maintain a feature list and your requirement will surely be considered. We are open to cooperation with other businesses or non-profit organizations. Do you provide transcriptions? SpokenData can help you.